You've spent months preparing for your big day! From your wedding shower to your bachelorette party, your girl squad was with you through it all. Show them how thankful you are for their support with a gift they can wear on your big day! Need a few ideas? Just keep scrolling, lovely! A touch of leather is perfect for an edgy evening or to balance out delicate floral printed dresses. 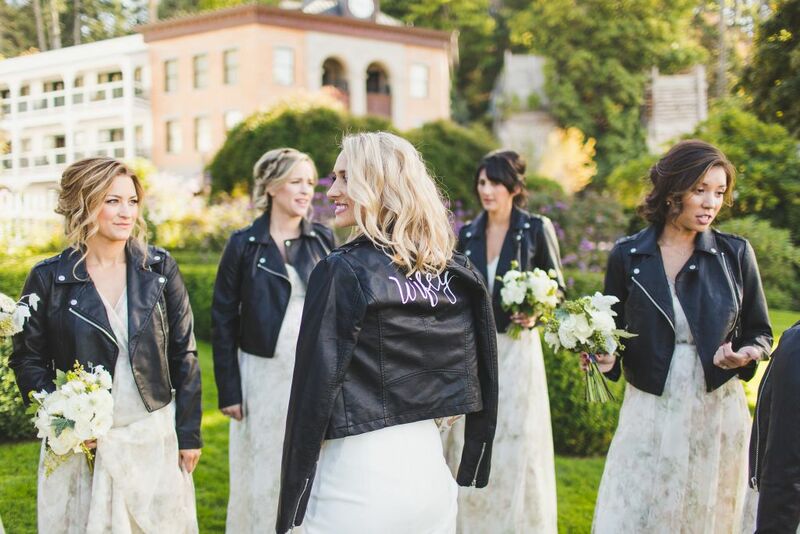 Molly's bridesmaids looked FIERCE in their monogrammed moto jackets! Stoles are a great companion for bridesmaids when taking outdoor photos in chilly fall and winter weather - BRRRRR! 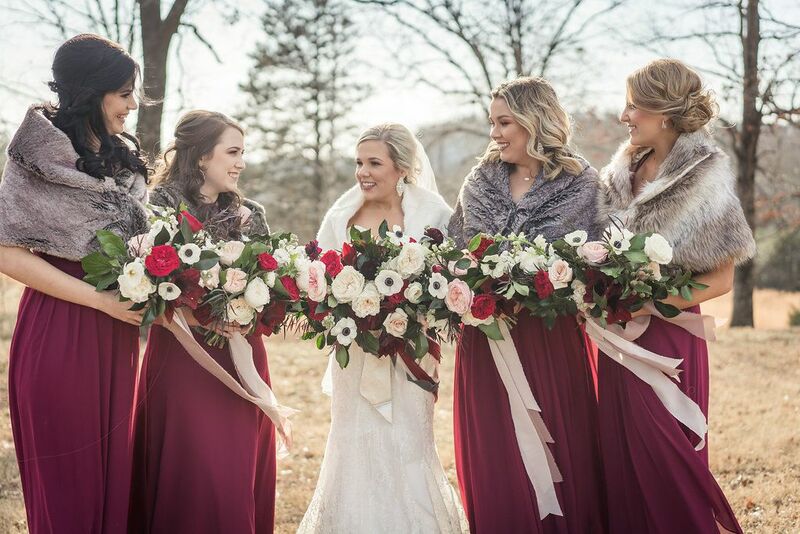 And, Courtney's bridesmaids looked absolutely fabulous - and warm - in their gorgeous fur stoles! Getting hair and makeup done can make your bridesmaids feel like Hollywood stars! But, sitting for hours while the entire bridal party gets dolled up isn't exactly a party - thank goodness for champagne and girl talk! To keep your ladies comfortable, a cute pair of pajamas will surely perk them up. 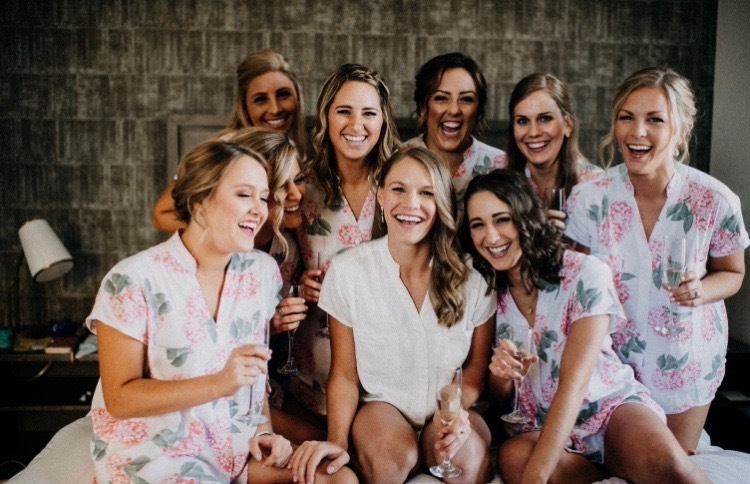 Take Claire's bridesmaids, who looked adorable in their PJs! An always appreciated gift is thoughtful and something you think they will actually use. That's why contributing towards your bridesmaid dresses is a definite YES! Who doesn't love a little $pring in their step? We make spreading the monetary love super simple for you when your bridesmaids order their dresses. Contact us for more info on how we can make your gift giving happen- your Bella stylist is here to help!